The NYC Japan Street Fair is Now JapanTown! Hi everyone! Just in case you didn't know, our annual festival is now called JapanTown, and because of the success of last year's event, we expanded this event to be a series of three festivals, each focusing on a different aspect of Japanese culture. Visit our website at www.nyjapantown.org and follow our new Twitter account @nyjapantown for more info! 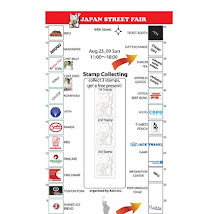 Our first festival, the JapanTown Cool Japan festival, is this Saturday, July 17th, 2010 in the East Village. Hope to see you there!